Any Royal Varity Performance has a special aura, but the sense of excitement and expectation was even greater than usual in 1935’s show, coming as it did in King George and Queen Mary’s Silver Jubilee Year. This was in spite of the King’s Illness, which placed a question mark over the show until his improvement at last confirmed that everything would go ahead as planned. In every respect this show formed a fitting climax and, sadly, an appropriate finale to the great encouragement and support that the King had given to the variety profession. 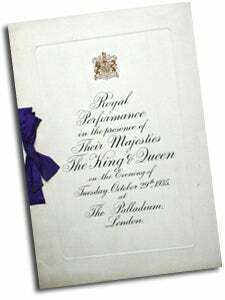 For the 1935 Royal Varity Performance proved to be George V’s last. The sovereign who, to paraphrase Sir Oswald Stoll’s words back in 1912, had invited ‘the Cinderella of the arts’ to the ball, died a few months later, in January 1936, leaving the royal patronage to live on in his heirs and successors. The night before the Royal Varity Show, the audience at the London Palladium were treated to a sneak previous of the best jokes for the special night! This impromptu ‘rehearsal’ as to judge the timing of the laughs so that the Royal Performance could be planned to a tight schedule. The ‘Feathered Flirtation’ scene arranged by Ralph Reader, was a wonderful delight for fans of song and dance. The dancing of Anton Dolin was considered superb, greatly complemented by the wonderful voice of Jessie Matthews. The singer was backed by J. Sherman Fisher’s Palladium Girls, who were exquisitely dressed in stunning apparel. An unusual act this year was Boy Foy, a seventeen-year-old juggler who delighted the Palladium audience by performing his tricks while cycling around the stage on a unicycle. A surprise group of performers drew one of the largest cheers from the audience. They were none other than the residents of Brinsworth House. Frank Bertram, aged ninety-four, who rang his hand-bells at Osborne for the entertainment of Queen Victoria, had a special introduction, as did Alice Leamar, who sang a verse and chorus of her famous song, ‘Her Golden Hair Was Hanging Down Her Back’, to prove that she retained her old ability. Nerves struck Will Mahoney in a truly dramatic way. When he heard the national Anthem at the start of the evening, he became comatose, lying cross the xylophone on which he would be dancing later. 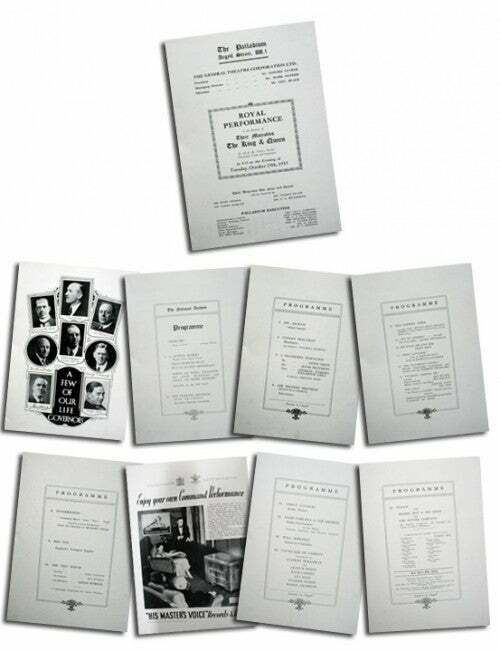 HANNAH WATT, JEANNE DEVEREAUX, NERVO & KNOX, NAUGHTON & GOLD, FLANAGAN & ALLEN, ERNIE GERRARD, THE SIX LIAS FROM ROUND ABOUT REGENT STREET. HANNAH WATT, JEANNE DEVEREAUX, HARRISON & FISHER, MYLES WILLIAMS, THE HARMONY REVELLERS, BEA HUTTEN, SYD RAILTON, DEL FOSS, NERVO & KNOX, NAUGHTON & GOLD, FLANAGAN & ALLEN FROM ROUND ABOUT REGENT STREET. ARTHUR REECE, KATE CARNEY, GUS ELEN, FLORRIE FORDE, HARRY CHAMPION, STANLEY HOLLOWAY IN CAVALCADE OF VARIETY.